یکی از ابعاد تحقیقاتی بسیار مهم از نظر ارائه دهندگان خدمات بانکداری الکترونیک، مسئله تقاضای جامعه می‌باشد و در مطالعات بسیاری این امر بر اساس نمونه‌گیری صورت پذیرفته، اما در هیچ مطالعه‌ای از کل داده‌های جامعه آماری استفاده نشده است. هدف اصلی این مقاله شناسایی و درک نحوه اثرگذاری عوامل مؤثری از قبیل میزان کارمزد، درآمد ملی، درجه شهرنشینی، نرخ باسوادی، نرخ تورم، تعداد دستگاه‌های ارائه خدمات و تعداد کارت‌های صادر شده بر تقاضا مطابق با مبانی تئوریک توابع تقاضا می‌باشد. انتظار می‌رود که به استثنای کارمزدها، سایر متغیرها تأثیر مثبتی بر تقاضا داشته باشند. 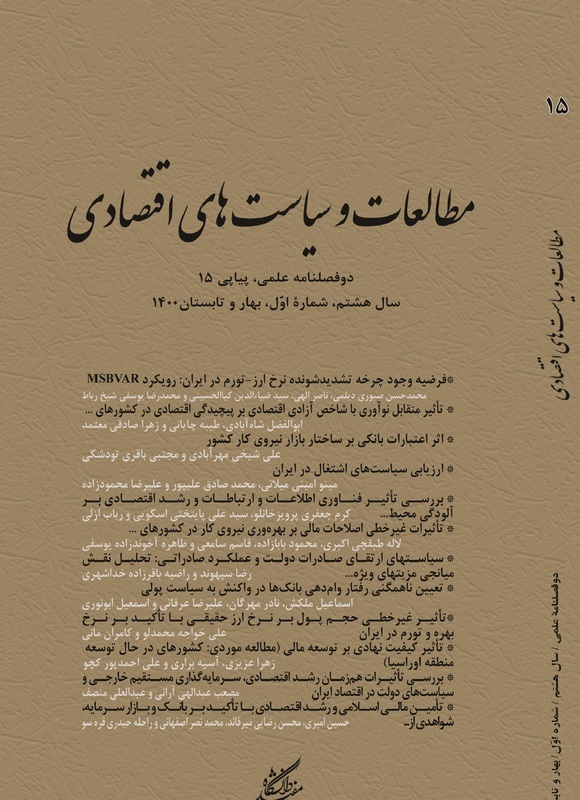 در امر مدل‌سازی پانل از داده‌های شانزده بانک در طول 1385-1389 و نیز تحلیل عاملی برای متغیرهای سری زمانی استفاده شده است. در مجموع تنها کارمزدها تأثیر منفی بر مقدار تقاضا دارند.کارمزدها به دلیل نبود جانشینی نزدیک برای این خدمات، کم کشش می‌باشند. One of the most important research aspects in view of providers of these services (electronic banking services) is the society demand. Many studies have been done on the basis of sampling but there is no study which has been done by entire data of statistical population. The main purpose of this research is to identify and analyses of the effects of factors such as fees, national income, urbanization rate, literacy rate, inflation rate, the number of service providing machines, and the number of issued cards affecting the demand; based on the theoretical demand functions. So, we expect that all factors will have positive effect on demand except fee. In the modeling, we use panel data of 16 banks during 2006-2010 and factor analysis method for time-series variables. Actually, only the fee has negative effect on quantity of demand. The factor fee has low-elasticity because there is no exact replacement for these services. الهیاری فرد، محمود؛ خدمات بانکداری الکترونیک و نیازهای اجرائی آن در مقایسه تطبیقی هزینه‌های عملیاتی، انتشارات بانک مرکزی جمهوری اسلامی ایران، پژوهشکده پولی و بانکی، 1384. بامداد، ناصر و نگار رفیعی مهرآبادی؛ «بررسی رضایت مشتریان از کیفیت خدمات خودپرداز بانک‌ها»، پژوهش‌نامه علوم انسانی و اجتماعی مدیریت، 1387، شماره 4. جانستون، جک و جان دیناردو؛ روش‌های اقتصاد‌سنجی، ترجمه فریدون اهرابی و علی اکبر خسروی‌نژاد، انتشارات نور علم، جلد 1، همدان، 1389. جهان بکام، سعیده؛«بررسی میزان پذیرش بانکداری الکترونیک در بین مشتریان بانک‌های شهر شیراز با استفاده از مدل پذیرش تکنولوژی»، پایان‌نامه کارشناسی ارشد، دانشکده علوم انسانی دانشگاه پیام نور تهران، 1386. دعایی، حبیب الله و طیبه کمالی؛ «بررسی عوامل پذیرش بانکداری الکترونیکی»، ماهنامه بانک و اقتصاد، 1387، شماره 93. گجراتی، دامودار؛ مبانی اقتصاد‌سنجی، ترجمه حمید ابریشمی، جلد 2، انتشارات دانشگاه تهران، 1384. مالمیر، مریم؛«بررسی عوامل مؤثر بر پذیرش بانکداری الکترونیک از دیدگاه مشتریان بانک صادرات تهران»، پایان‌نامه کارشناسی ارشد، دانشکده علوم اجتماعی و اقتصاد دانشگاه پیام نور تهران، 1389. Aladwani, M.Adel; 2001, "Online banking:a field study of drivers,development challenges,and expectations", International journal ofInformation Management, Vol. 21, PP. 213-225. Baltagi, Badi H; 2005, "Econometric Analysis of Panel Data", John Wiley & Sons, Third Edition, West Sussex, England. Eviews 7 user’s guide; 2009, http: www.Eviews.com. Eid, Muhammad and Maher Sbieh; 2009, "Market Demand Assessment forE-Banking Services in Palestine", In cooperation with Lagerkvist and Söner AB. Gan, Christopher and Mike Clemes and Visit Limsombunchai and Amy Weng; 2006, "A Logit Analysis of Electronic Banking In New Zealand", Commerce Division, Lincoln University Canterbury, No. 108. Gharoie Ahangar, Reza; 2011, "An Investigation Into The Determinant of Customers' Preferences and Satisfaction of Internet Banking (Empirical Study of Iranian Banking Industry)", Journal of Applied Sciences, Vol. 11, No. 3, pp. 426-437. Kennickell, Arthur B. and Myron L. Kwast; 1997, "Who Uses Electronic Banking? Result From The 1995 Survey of Consumer Finances", Division of Research and Statistics, Board of Governors of The Federal Reserve System, Washington DC. Kolodinsky, Jane M. and Jeanne M. Hogarth and Marianne A. Hilgert; 2004, "The Adoption of Electronic Banking Technologies By US Consumers", The International Journal of Bank Marketing, Vol. 22, No. 4, pp. 238-259. Phillips, P. C. B; 1986, "Understanding spurious regressions in econometrics", Journal of Econometrics, Vol. 33, pp. 311-340. Pour Mirza, Arezou and Mohammad T. Hamidi Beheshti and Asa Wallstrom and Omid Pour Mirza; 2009, "Adoption of Internet Banking by Iranian Consumers: An Empirical Investigation", Journal of Applied Sciences, Vol. 9, No. 14, pp. 2567-2575. Robinson, Justin and Winston Moore; 2007, "Attitudes and Preferences in Relation to Internet Banking in the Caribbean", First Caribbean Iinternational Bank. Sedeghi, Tooraj and sahel farokhian; 2010, "Electronic Banking Acceptance Model (EBAM) in Iran", World Applied Sciences Journal, Vol. 11, No. 5, pp.513-525. Tsay, Ruey S; 2010, "Analysis of Financial Time Series", John Wiley & Sons, Third Edition, New Jersey. Varian, Hal R; 2005, Intermediate Microeconomics: A Modern Approach, W.W.Norton and Company, Seventh Edition, Berkeley, California. Wungwanitchakorn, Aungkana; 2002, "Adoption Intention of Banks’ Customers on Internet Banking Service", ABAC Journal, Vol. 22, No. 3, pp. 63-80.